Retro candy gift baskets are the ideal way to bring back sweet memories of days gone by and bring a smile to the face. Everyone has a sweet memory from their youth. When feeling down, why not divulge in the sweet treats we remember from those warm summer days, when there was no a care in the world? Retro candy boxes offer the perfect means to do just that. Cheering someone up with retro candy is also affordable. Prices for this candy will not break bank. Their prices are fair enough that when you make your selection to cheer up that chum, be sure to pick up some retro candy of your own. Share it with family along with some memories of youth and not only will everyone be cheered up, it will be a quality bonding time. These quality gift boxes can be made specific to a person's year of birth, or they can be fashioned after a time one remembers fondly. If the individual you are trying to cheer up was born in the 50's but loves the 70's when they were in college, that is not a problem. Symbols and candy on their retro candy gift baskets can be for whatever time period you desire. These nostalgic candy gifts are also not just for cheering someone up or birthdays. Get one for an anniversary, after someone has surgery or has a baby and even for graduation gifts. Whatever the occasion retro candy boxes make the perfect gift. Make sure to add some nostalgic items to your gifts as well. Some popular nostalgic gifts include hats and glasses. Why not get a pair of brightly colored diva glasses for that someone special? Or maybe include a pair of glasses that say Happy Birthday! Other styles of glasses include those shaped like guitars, smiley faces and ones that convey the message, 'over the hill'. What would cheering someone up be without also having some funky hats? The wild and the wonderful all come together to remind us of days gone by and fond childhood memories. There are mod velvet hats from te sixties, flower power hats, and even hats that resemble foliage. Want to go a step further for a birthday? Get a unique hat that is shaped like a birthday cake! Whether one in a kid or a golden oldie, there is a birthday hat that will fit the age and occasion. The sure fit to cheering someone up is to remind them of the things that made them happy in the past. Many find that toys and candies from their childhood give them fond memories and give them a warm feeling that will last for days. So, when getting that retro candy gift basket for the one you love, a best friend, or even a parent, why not also throw in some of their favorite toys from the same period? These will be sure to brighten their day and say I Love You in a way no other gift can. Turning sixty does come with a few perks. You are that much closer to retirement! You get birthday presents that you actually want, you can pass for a senior discount, and you are getting wiser with age! But you are in fact, you are getting older. So if you know someone born in 1952 that has a birthday coming up, it is important to get them a gift that is sweet, comforting, and might even have some nostalgic value concerning their days of youth. A 60th birthday gift can truly be a special one. By getting a gift that lets your loved one know you appreciate them and the era when they were at the height of their lives, you can make the occasion of getting a little older a unique and comforting event. We have all heard stories from our older relatives about when gas was only thirty five cents a gallon and they had to walk to school uphill both ways in the snow. Buying them a 60th birthday gift that has memorabilia from those decades can really put a smile on their face. Gifts such as candy baskets let your loved one know that you appreciate their stories and advice that they have shared over the years. 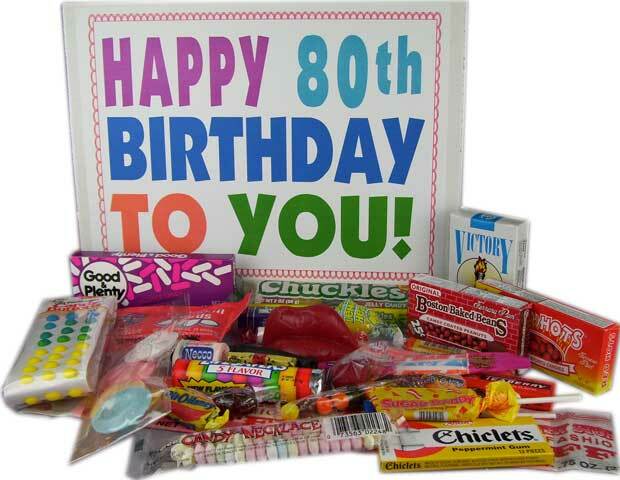 Candy Baskets are the perfect sweet gift to commemorate a 60th birthday! Give them a gift that will put a little treat in their day and allow for many small celebrations over having made it this far for weeks to come! A 60th candy basket can be ordered that has candy from the era that they loved so much. Classic candies like Dots and Swizzlers will take them back to the afternoons where fifty cents got them in to see two movies and get a box of candy with a soda! Retro candy overflowing from a 60th candy basket is the perfect gift for the person that already has everything that they want! A person born in 1952 will be touched by the thought behind a candy basket that is full of Rock Candy, Sugar Daddies, Red Hots, and Candy Buttons on Paper! 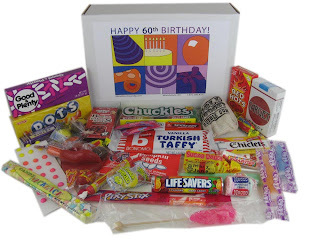 They simply do not make candy like that anymore and a 60th candy basket is sure to make for a birthday celebration that will allow for all of those fond memories to come flooding back. Grandma and Grandpa will have the chance to tell the old stories about hanging out by the candy store in the afternoons and spending those hard earned nickels on a sweet treat. The candy basket collection can be personalized for your loved ones to make the occasion special. In addition to candy, the basket can be customized with signs can be kept around the house for years to come. Taking a stroll down memory lane on your birthday has never been sweeter! Finding the perfect gift for a friend or loved one's birthday is never an easy activity. The person tasked with the job could spend hours or days scouring stores and the internet for the perfect, unique 30th birthday gift. To help out all those folks stuck looking around for birthday gifts for friends and family we've compiled a few good gift ideas that are a perfect fit for a 30th birthday gift. A great option is creating a birthday basket. Candy baskets are a simple, easy and really enjoyable gift that will make a loved one's birthday feel truly special. Simple get a wicker basket and pack it filled with your friend's favorite treats. There is even birthday candy baskets already assembled to make the gift giving experience even easier. If you are shopping specifically for a 30th candy gift basket; consider grabbing up treats from back in the day; the year your friend or loved one was born. These baskets come packed with treats that elicit memories of one's childhood. After all, who doesn't like a gift basket? The answer is no one. There are few people who wouldn't light up when they saw a birthday gift that included a basket topped with their favorite treats from childhood. 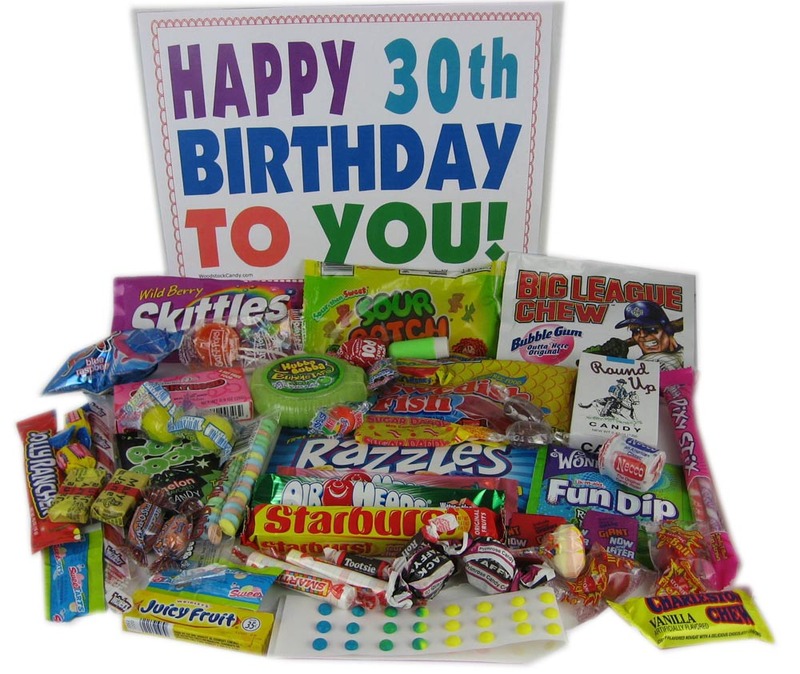 30th candy gift baskets are especially wonderful because most people who are closing in on the big 3-0 are thinking about how quickly time has gone. A 30th birthday, for some, is traumatic. They are leaving their carefree 20s and entering the true "adult age" or the "scary age". Well, you can easily remind friends and family that even if you are getting older you can always act like a kid and enjoy a wonderful candy basket. If you are looking to get really personal you can even top the birthday candy basket with other presents and gifts that speak of a simpler time. Adults who grew up in the 1980s often remember Yo-Yos, Hulu Hoops and Silly Putty with great nostalgia. So, throwing in a couple old-school toys with a candy basket can truly personalize a gift. If you aren't into the idea of cheap, childhood toys consider creating a mixed CD of songs from the 1980s as an addition to the basket. If you are creating a gift for a close friend adding all of your favorite songs from your youth together into one CD will really hit home hard. Now that you know about the wonder of 30th birthday gifts it is time to get out there and start shopping. 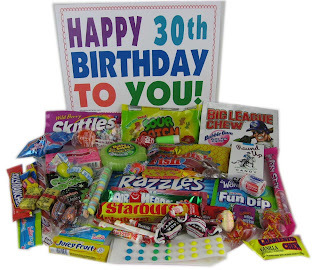 I'm sure you have at least a few people out there who are about to turn the big 3-0 and are in desperate need of a candy fix. Everyone has a birthday each year and some birthdays mark milestones that should be celebrated. Birthdays where people turn 30, 40, 50, 60 and 70 are the most important, and people will make sure that they purchase gifts especially for these milestone years. When a person turns 70, families will try to purchase the perfect presents to make sure that they show their happiness and gratitude towards family members. When an individual turns 70, it can be quite difficult to figure out what to buy as a present. Most people have everything that they want at this age, and they wish to celebrate their birthdays simply. Small family gatherings are set up for parties and family and friends will make sure to get the nicest and most thoughtful gifts that they can. A 70th birthday party gift is searched for that is just right, and people often decide on gifts that contain treats for older adults. A candy basket is one gift that is purchased as a 70th birthday party gift because most people love to indulge and eat sweet treats. A 70th birthday candy basket contains chocolates, hard candies, and cookies and these can be picked out to customize each basket. 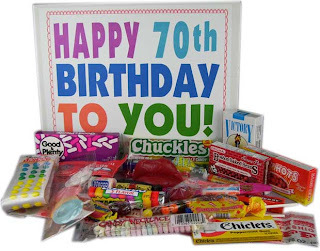 Treats that are liked by the loved one who is celebrating their birthday are chosen and all sweets are arranged in the 70th birthday candy basket so that they look attractive. Candy baskets are covered with cellophane and ribbons and balloons are attached to the top of baskets. Decorative items add a personal touch to baskets and cards can even be picked out that can be attached to the front of baskets. Parties are planned for people celebrating their birthdays and 70th birthday party ideas are looked at so that decorations, plates and cups can be purchased. The best 70th birthday party ideas will include colors, photographs and personal touches that celebrate a person's life. Old photographs can be arranged at parties and all family members can choose their favorite snapshots so that collages can be made and placed at birthday parties. Some parties that are more fun are considered for people who turn 70, and balloons, flowers, and confetti are chosen to make parties seem festive. All decorative items should be found that match one another. These matching decorations create themes for parties and a 70th birthday party will look well put together. Cakes and beverages are chosen that match themes as well and this is important if beach or tropical parties are planned. A person's fortieth birthday is probably the biggest celebration they will have after they turn sixteen and can drive a car or turns twenty-one and can drink their first beer. It's one of those few years we even have a special name for: over the hill. That's why when it comes to this birthday celebrants should come prepared with some great over the hill birthday ideas. Over the hill gag gifts that remind the guest of honor they're getting a bit older are always popular- things like a vulture hat or cobweb decorations. It can sound a bit macabre to give gifts that remind a person they're growing older but Over the Hill birthday gifts have become something of a life-affirming tradition. Yes, a person is older but they are going strong! So don't be afraid to pick a gray wig off the shelf or leave a fake tombstone on their lawn with the other decorations. 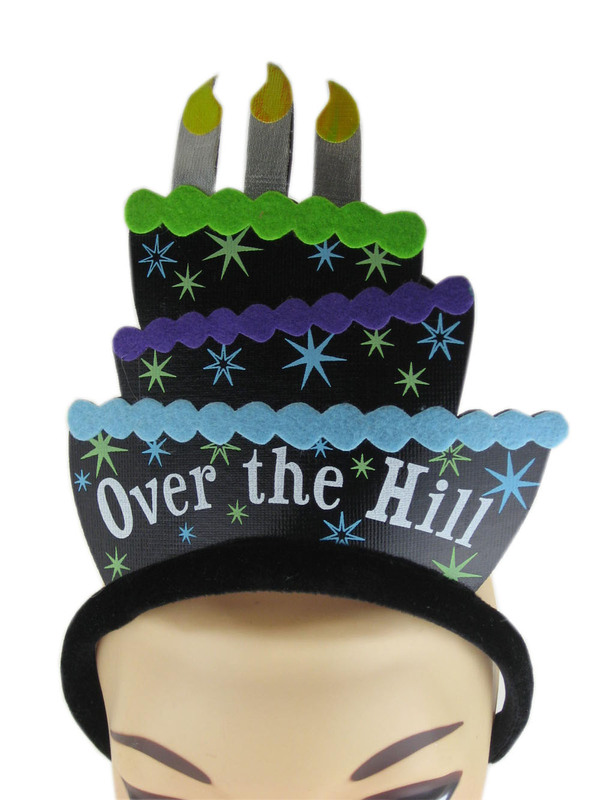 Over the hill gag gifts work especially well with friends who don't show their age. The forty year old woman training for a decathlon and who still gets carded at the liquor store will probably garner quite a few laughs from the gag gift suggesting she's over the hill. Don't feel obligated to stick with only jokes for presents when you're choosing over the hill gifts, however. All kidding aside, over the hill gifts not just a reminder that a person has made it to the top of the hill but also that the hard up-hill part is over. Sometimes people say "it's all downhill from here," as though it were a bad thing! Anyone who has every climbed a tall hill knows that the best part is the relaxing, easy walk back down. Remind a friend that all the hobbies they never had money or time for before are still there or of the things they wanted to do when they were younger but couldn't. Over the hill birthday gifts are a way to kid someone into realizing "Hey, you're getting older- but you're not dead yet." Over the hill birthday ideas can always include the gag gifts that jokingly allude to a person's age, but don't feel obligated to stick to jokes. The fortieth birthday can be one of the more important years of a person's life. It's an opportunity to remember all they've done in their life and then discover that there's time left to do so much more. Bringing up the original gumby television show in conversation will usually put a sweet look of nostalgia on most faces, unless they are too young to remember or haven't been introduced to a gumby toy or an episode. A Gumby Toy- Bendable in most directions will have them becoming fans in no time at all! In the song that opens the Gumby show, Pokey is introduced as Gumby's pony pal, which really meant, his best friend! The Pokey and Gumby figures represent only two of the cast of characters. The show also features Gumbo, Gumby's father and Gumba, Gumby's mother. The names are a play on Latin words that Art Clokey, Gumby's creator, found comical to include! Gumby's parents are very kind, practicing good manners in all they do, whether they are rescuing their son from impending danger or helping him learn lessons around the house. Gumby bendable figures are a clever way to play along with the Gumby television show, and an exciting way to create new Gumby and Pokey adventures! Art Clokey created a whole cast of characters that he often included in the original gumby television show episodes. Fine pair of friends called, Prickle and Goo, were created to represent the two kinds of people in this world. There are the prickly people who often pick and criticize others, like Prickle, the yellow clay dragon. Then there are the more laid back, happier types, like Goo. Goo is a sort of flying, blue mermaid who constantly looks out for Prickle without his knowledge. A gumby toy collection should include these two figures for lots of playtime fun! In the 1980's Minga was added to the Gumby show. She is the spunky, pink little sister to Gumby. 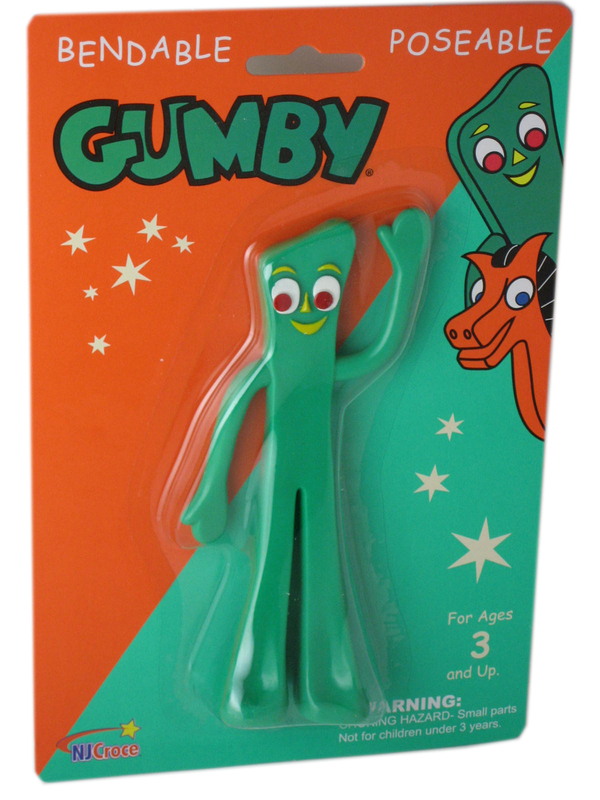 A Gumby Toy- Bendable collection should include little Minga for tons of Gumby adventure fun! Enjoy recreating the Minga episode where she is trapped and rescued from a mine shaft, or the one where she is lost in Chinatown. Children today would greatly benefit from the lessons taught in the Gumby show. There are moral meanings to be found in most episodes. For example, in the episodes featuring the Blockheads, they are always shown getting into trouble. They do block headed things that sometimes hurt Gumby or put him in difficult situations. This is frowned upon! Pokey and Gumby bendable figures were very popular in the past and continue to sell well now, even if they are in the nostalgia section! Many children today might find Gumby figures in their mom or dad's memory boxes and wonder what in the world they are. The quickest way to get the young ones to join the Gumby figures collecting club is to show them the old television episodes. As they get to know Gumby and Pokey, and other beloved characters like, Professor Kapp, the helpful Groobee, Gumby's girlfriend Tara and Nopey the dog, they will most likely fall in love. After all, if you've got a heart, Gumby's a part of YOU! The 1960 was without a doubt, a time when love and freedom were the order of the day. It was times, for those who remember when you could just let it all hang out, as the saying often goes. That is why the Flower Power Hippie Hat is such a symbolic piece of unique apparel that makes a powerful "time period" fashion statement. Probably no other hippie hat can deliver such a clear and lasting impression of what the 60's truly represented. This flower hat is so reminiscent of what that era stood for, and what people were feeling during this special time in American history. Complete with flowers dangling from the brim, the Flower Power Hippie Hat is sure to catch the attention of anyone who appreciates the freedom of expression that was so much a part of the 1960's culture. A flower hat speaks of simplicity and gentleness, and gives a sense of genuine happiness to those who proudly wear this unique slice of 60's apparel. There are countless styles of hippie hats available on the market, but one featuring the flower power theme is special, and is quite possibly the signature style that defines an important era. As most baby boomers will recall, the 1960's was an era that set many in society apart as being free to express their feelings openly, as well as being free to step outside accepted social norms. Owning and wearing a cool and captivating Flower Power Hippie Hat is the perfect way to let those around you know that you identify with those attitudes and beliefs. A flower hat is the ultimate in free unrestricted self-expression. As with all fashion statements, 1960's apparel offers trendy people the opportunity to have fun with clothing by mixing and matching all kinds of 60's style wear. In addition, this style of hat can make a perfect hat for birthday parties, as well as 1960's themed parties, and even New Year’s Eve parties. A birthday hat that includes 60's style flowers is just one way to stand out and be noticed for having a clever sense of fashion. A birthday hat with 1960's appeal is sure to inspire others to search out similar styles, and even prompt them to inquire as to where you found such a trendy hat for birthday gatherings. Regardless of if it is a birthday party, or a holiday party, or even just a "whenever" party, one thing is certain, and that is that 1960's apparel will spice up any event. Get ready to express yourself with a vibrant and highly visible hippie hat, and expect to get great and reassuring compliments from friends and family, regarding your unique choice in stylish hats. As with the 1960's attitude, fashion in general should be about having fun, and playing with different fashionable ideas. Sampling new looks and combinations of styles is a great way to open up new and interesting conversations, and get people talking again, the way they once did way back in the fun 1960's. Just imagine your child's surprise to come home and see a happy birthday sign at the end of the driveway. As they walk up to the door they see the big nice happy birthday banner and all their friends and family standing waiting for them for their big day. These are things that children look at and think about when they think of their big day. They expect that they will see birthday banners somewhere for everyone to see. It is all part of the art of throwing a birthday party. Banners for birthday parties come in all sizes, designs, and colors. Happy birthday banners are plastic and can be easily be used for inside or outside. So for your child's big birthday bash you can put birthday banners outside to greet your guests and inside for everyone to see during the whole party. They are easy to hang and come with four grommets so anybody can easily hang these banners. And since they are plastic they can be reused year after year to save the party thrower some money. The happy birthday sign comes in your basic red, yellow, blue, green and pink so it can go with any birthday party theme you are using for your child. Doesn't matter if you have a boy or a girl they will love this birthday banner and so will their friends. Even other parents will be asking where you got your banners for the birthday party because they want to get one for their selves. They are inexpensive so everyone can afford to get many birthday signs and put them up for everyone to see. You can put them out to lead people to your party and in front of the house so no one will miss the party that you have worked so hard on for your child's special day. And at the end of it all your child will love you that much more for putting so much love and effort into making their day special. Birthdays only come once a year so do it big for your special child and get these wonderful birthday banners to make their day wonderful and special. And all their friends and parents will compliment you on how wonderful a job you did and how nice your birthday signs are. Your child's birthday party will be the topic of conversation for weeks and your child will feel great that you made such a wonderful day for just them. Children should not get to have all the fun during the winter holidays. Kids may enjoy candy canes, an astounding amount of presents, cartoons about reindeer and snowmen and more, but adults deserve some Christmas cheer too. That is why adults invented mistletoe and spiked eggnog. However, there is one Christmas tradition any generation can agree on. Santa Claus is the best part of Christmas and that should not change when one grows older. Kids may know Santa as the jolly old man that gives them toys but adults will come to recognize him as the life of the party. A Santa Claus suit is perfect for any adult Christmas party. Santa will be the best dressed guest at every holiday party. One can purchase a large Santa Claus suit to fit any body type. A large suit is best regardless of the size of the person lucky enough to be chosen as Santa. Bigger body types will fit comfortably and small frames can stuff and cinch the suit until they appear to a have a belly like a bowl full of jelly. The large costume should be comprised of a fetching coat, hat, drawstring pants, plush boot tops, and belt. The two most important pieces should also be included. The red suit is still a necessity but nothing quite completes the picture like the wig and beard. The whole package will make Santa the spotlight at any party. Make sure to congratulate Mr. Claus if he manages to hang onto his hat and beard as the party rages through the night. Traditional Christmas parties can be fun but do not properly express the season. Christmas is a time of laughter and vibrancy. Bringing Santa to an adult Christmas party introduces a sense of whimsy and fun. A Santa Claus suit works for many occasions during the winter season. Santa can surprise guests at family or office parties. Many people also use their suit for community events or at gatherings for a club or organization. They say that it is better to give than receive at Christmas but many people stress over the giving part. Giving to others may be a virtue but it is also expensive. The best part about buying a large Santa Claus suit is that it is affordable. This novelty costume will fit into any budget and can be reused every year. No one ever gets tired of Santa. Many also rent their Santa suit out to others to generate a little more income for buying presents. Many people know how to be the life of the party, but no one commands the room like Santa does. Whether the guests know to expect him or he's a special treat, every party will be more memorable and entertaining with Mr. Claus. A SantaClaus suit is a great addition to any adult Christmas party. Children may get all the presents on Christmas morning, but adults will have a blast during the holidays too. There is nothing that says happy birthday like happy birthday sunglasses. They are cool, they are festive, and most importantly, they only need to be worn once a year! If you are looking for a funny way to celebrate your best friend's birthday, then getting them happy birthday sunglasses is a fantastic way to go. Birthday sunglasses are hilarious because everyone will be able to tell that your friend is having a birthday. You can even buy birthday sunglasses for yourself if you want it to be festive and so no one to forget your birthday. If you want to get someone sunglasses for birthday, then why not get them happy birthday sunglasses? It will be a fantastic way to celebrate someone's birthday, and the best part is that they make a great birthday gift. You can even get certain numbers on the sunglasses to help them celebrate that special time of the year. If you cannot think of a way to say happy birthday to a loved one, then understand that there is no better way to say happy birthday to a loved one than by getting them these sunglasses. They are festive and they let everyone know whose birthday it is on that incredibly special day. Sunglasses for birthday = Best birthday ever? Do you want a unique gift to give your loved one? Well, now you can do that by giving them these sunglasses. They are unique, and for that whole day, no one is going to forget whose birthday it is on that special day. These sunglasses have a funny way of being hilarious to the people that receive them. Depending on the particular product that you decide to buy, but most of the time, they make a hilarious gift that will be a great laugh over someone's birthday. Great gift for girlfriend or boyfriend! Are you looking for a way to get you ahead with your boyfriend or girlfriend? Well, these sunglasses make a great additional gift to whatever you get them. The best part is you will get to see them have a genuine laugh on their birthday because these sunglasses have been known to give people a hearty giggle, and what better day to have a hearty giggle than on the day of your birthday. Are you looking for a gift that will be inexpensive? Well sunglasses are a great gift that will not be expensive in the least. In fact, if anything they cost too little. They are a great way to save money, and they are guaranteed to give that special someone a hearty giggle. These are some of the reasons that you would want to purchase sunglasses for birthday. They are a festive gift that acknowledges someone's birthday, and they make people smile on their birthday. There is nothing better than being happy on your birthday, and this is one of the ways that you can help your loved one to be happy on their birthday. Any surgery can be a very scary time for the patient. If someone you love is undergoing a surgical procedure you will likely want a gift to bring to them as they recover. A get well soon gift is often the appropriate choice. This can help to remind someone that you are thinking of them as they undergo a procedure that requires some recovery. An after surgery gift is often received after surgery is completed. Many people have to stay in the hospital at least overnight after surgery. For others, a surgery may be an outpatient procedure that requires rest at home. You can bring an after surgery gift to the hospital or to someone that is recovering from home. A get well gift should be one that is going to make the recipient smile. This can actually help them to recover faster if their spirits are lifted. A candy basket is a great get well soon gift. A candy gift basket can be used for anyone that is undergoing surgery, and this can be for children all the way to the elderly. There is a candy gift basket for all age groups. Nostalgic candy is something that can invoke good feelings in people. Candy that people ate when they were a kid will help to bring back great memories. Many people remember the specific candy that they loved as a kid and this makes a great get well soon gift. Back surgery is a very common surgery that people undergo at all stages of life. 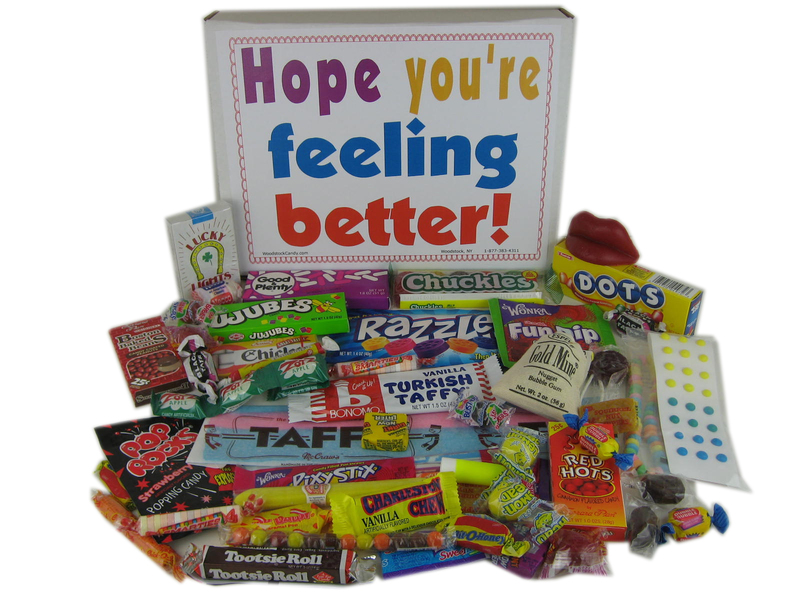 A back surgery candy gift basket can be the perfect way to show someone that you care. Back surgery can often be very intense, and require a very long recovery period. A gift basket specifically made for a back surgery can be more personal for the recipient. You can also choose a more general gift basket that is made for men, women and children. This can be a great gift basket to give someone that is undergoing surgery and even someone that is sick. Candy is a great way to cheer up when you do not feel good. Simply looking at the candy can instantly help someone to feel better and take their mind off recovery for a minute. An after surgery gift can also be geared towards children of all ages. There is a candy basket that is specifically made for children. This can be more personal for the child that is sick or undergoing a procedure in the hospital. You may also want to look at a gift basket that is filled with retro candy for the older recipient. Retro candy is very popular, and a basket filled with this candy can be a delightful gift. A get well gift basket will come in a shrink wrap form adding to the present feel of this type of basket. It can easily be placed in the hospital and can be fun to look at. You can use a surgery gift basket for anyone in your life that you want to show how much you care.